Carolyn Cole, author of 'Emma', is a staff photographer for the Los Angeles Times, who won the Pulitzer Prize for feature photography in 2004. She is a graduate of the University of Texas, as well as the School of Visual Communication at Ohio University. This short story is told from the first person perspective of a little girl called Dorian York. The focus of her thoughts is her mother; the games that they play together, and the games that she plays with her friend, that revolve around her mother. The first person perspective of the narrative gives the reader an intimate view of how the little girl sees her mother, as well as how she feels about her. We are also able to garner information about the people around her from her innocent narrative, innocent because the little girl does not understand many of the things that she reports. The audience learns that Emma and Mr. York have a volatile relationship that is seemingly caused by his infidelity. This infidelity is initially implied by Emma’s constant watching of the clock and waiting for her husband to return home, as well as the fight that Dorian reported. Grandfather’s visit, however, brings a happy atmosphere to the family unit because daddy starts to do things with the family, hence they seem more like a conventional happy family. The audience is given the impression that things go back to normal after grandfather leaves, however, due to the spectral presence of the ‘lady at the train station’, as well as Mrs. Robinson’s pointed discussion about Mr. York’s status as a ‘player’. The narrative climaxes with the death of Emma at the train station. She saw her husband with the mysterious lady and runs away, followed closely by Dorian and Jack. Unfortunately, when Jack caught her by the arm, she ran into the path of an oncoming vehicle and was killed. Jack and Mrs. Robinson then get romantically involved, and they send both Maria and Dorian to St. Agnus, a boarding school, in the country. The story occurs in three places; the York residence, an unnamed mall and the old train station. The mood of the story fluctuates from happiness to sadness. He is Doran’s father and Emma’s husband. He is characterized as a ‘player’ by Mrs. Robinson. He is not faithful to his wife. He was not ready for the arrival of his daughter, Dorian, and does not seem to have a close relationship with her. She is Dorian’s mother and Jack’s wife. She is a good mother who plays with her child and treats her well. She is a good wife who loves her husband (as seen in how she greets him when he gets home) and is considerate of his feelings; as seen in her reasons for not having another baby. She is a very smart and polished lady who can handle herself with people who are coy and critical of her; as seen in her argument with Mrs. Robinson in the mall. A very innocent little girl who is the first person narrator of the story. She is younger than her friend Maria, who is nine (9) years old. She adores her mother and her grandfather. She is often puzzled by the content of adult discussion. Brought joy into the family because daddy stayed home, came home early, and spent quality time with the family, due to grandaddy's implied interference. Loved her grandfather because he seemed to do what her dad didn’t – spent time with her – and her first person perspective of him reflected her love. She is Emma’s friend and Maria’s mother. She is not a good friend to Emma because she is both critical and jealous of her. She gets romantically involved with Jack after Emma dies. She’s very impatient with both girls. She sends Maria and Dorian to boarding school in order to enact her plan to keep the ‘player’. She is the nine (9) year old daughter of Ruby Robinson. She filters and explains a lot of the adult conversations that Dorian does not understand. This theme is epitomized by Dorian York. The story is told from her perspective, therefore, the reader gets a firsthand view of the innocence behind her misunderstanding of adult conversation and situations. She senses emotions, but misses a lot of the innuendo, as is seen when she tells the audience about the fight that her parents had. Her innocence is also seen in her expectation that her mother would come home after the accident, but instead, she finds Mrs. Robinson in her mot her’s bed. Her growth, or advancement into maturity, is highlighted in the end of the short story when Dorian reassures Maria that everything will be ok, they will play adult games better. There are two types of families in this short story, the nuclear family and the single family unit. Dorian’s family is the nuclear family, consisting of mother, father and child. 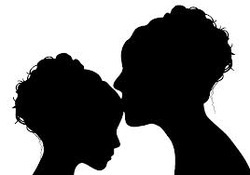 This family is a troubled one because the father is seemingly more absent than present due to an implied ‘other woman’, who is later confirmed as very real. He also seems uncomfortable around his only child, as is confirmed by Emma, who decides to forgoe having another child because ‘Jack wasn’t ready for Dori’ (Cole, p.53). Emma, on the other hand, seems to live to please both her child and husband. She is very affectionate with Dorian, and this love is returned ten fold, as seen in the adoration that imbues the tone of the narrator. She is the same with her husband, but the reception is less enthusiastic. It would be unfair to say that the family is dysfunctional, because one parent is at least invested in the emotional happiness of the child, but the family has issues because the head of the household’s concentration lies elsewhere. Mrs. Robinson is a single mother, parenting her only child; Maria. She does not appear to be particularly liked by both girls because no-one wants to ‘play’ at being her. She aggravates her child constantly and appears to be unhappy with her life. This family structure can be seen as dysfunctional because the parent does not seem to devote her energies toward making her child feel loved and comfortable, which is one of the primary aims of any family structure. There are two contrasting friendships in this short story. There is the friendship between Dorian and Maria, which is characterized by play, conversations and support of each other. Then there is the friendship between the adults, Emma and Mrs. Robinson, which is contrastingly characterized by cattiness and jealousy; mostly on Mrs. Robinson’s part. The motif of play appears to be a strong one in this short story, perhaps due to the fact that the narrator is a young child. The children ‘play’ at being adults, immitating – and fighting over – their favourite adult. They also literally see the life of adults as play. Dorian confirms this at the end of the story when she reassures Maria that ‘I learned a lot about this game. When it’s our turn to play, we’ll play smarter.’ (Cole, p.58). The deck of cards that Emma carries around in her purse is a powerful symbol for life. In any card game that is being played, every-one has a chance at success, or failure, depending on how they play the game. Mrs. Robinson gives Emma an alternate way to play the game of life, with success being the joy of keeping her ‘player’ husband. Emma, however, chooses to play the game in an another way, one in which she attempts to satisfy the needs of both Dorian and Jack. Emma is the loser in the game, however, because she dies with the joker in her hand. This signifies that her future could have gone in any direction because the joker introduces the element of chance to the game; it can be a bonus, a penalty, or both, depending on how it is used in the game. In the game of life, Emma lost because she chose to take a chance with pleasing both members of her family, instead of concentrating soley on her husband, as Mrs. Robinson suggested. The game of life gives every-one chances however, just like a card game, and Mrs. Robinson was given a chance to bag her rich man with Emma’s exit from the game. Cole, C. 'Emma' in A World of Prose, edited by David Williams and Hazel Simmons-McDonald. (Harlow, Essex) Pearson Education, 2005.